The Saharan cypress is one of the world’s oldest trees, with ages in excess of 2000 years. 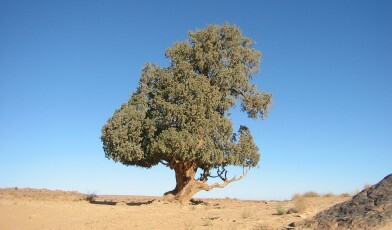 The trees are the relict species of a Saharan forest, from a time when the area had a milder, more Mediterranean climate. There are subspecies of this taxon, Cupressus dupreziana var. dupreziana found in Algeria and Cupressus dupreziana var. atlantica found in Morocco. Both these subspecies are assessed by IUCN as Critically Endangered. Today, the species is rare, with only 233 known individuals left growing in the wild on the Tassili N’Ajjer plateau in southeast Algeria. A population of around 6500 trees is found in Morocco. The species as a whole is assessed as Endangered. Its habitat is described by UNESCO as very exposed, hyper-arid and barren. Despite these harsh conditions, the tree has adapted well and is one of the most drought resistant species known, with considerable frost tolerance too. It can take advantage of extremely brief wet cycles including winter hoar frost and morning dew, sometimes adding more than one growth ring per year. Conversely, in severe drought the trees may not produce a growth ring at all. The wood has medium density, is stable and aromatic. Traditionally the wood was used for saddles by the Tuareg people and also as a structural timber due to its strength and resistance to decay. There are doors made from this timber in the nearby town of Ghat which have been carbon dated to around 400 years old. Due to its high drought tolerance, the Saharan cypress could also be a valuable species for planting in arid regions. The tree has become a threatened taxon mainly due to its disturbed natural regeneration from grazing by wildlife and stock – camels, donkeys and goats all roam the plateau. Only 3 seedlings were reported in situ the 20th century (Maire 1952, Camus 1958 and Debazac 1961). As the existing population is made up of predominately mature and over-mature trees in senescence, there is a real risk of eventual extinction in the wild. Nomads use the trees for shelter and their herds destroy any regeneration. The area is also part of an emigration route from Niger to Libya and passing groups collect firewood from these trees. Remarkably, floods are also a threat, as the wadis that are dry for so much of the year, can quickly become a raging torrent during a flash flood. During the past 20 years various expeditions have made collections of cones by institutions including the Algerian Forest Service and the Forest Research Centre at Ariana, Tunis. The Smith College Botanic Garden (US) includes two trees that were grown from seed collected in 1985 and these are being propagated to enable distribution to other botanical gardens for study and conservation purposes. Bedgebury National Pinetum has one grafted plant. Formal conservation of the remaining wild population of Saharan Cypress will be required if the species is to be protected. It may be possible to reduce pressure in one or two intensively treated and protected sites but the feasibility of an in situ project still needs to be researched. Abdoun, F., Gardner, M. & Griffiths, A. 2013. Cupressus dupreziana. The IUCN Red List of Threatened Species 2013: e.T30325A2792650. http://dx.doi.org/10.2305/IUCN.UK.2013-1.RLTS.T30325A2792650.en. Downloaded on 24 November 2015.